Lethal coalitionary aggression is of significant interest to primatologists and anthropologists given its pervasiveness in human, but not nonhuman, animal societies. Chimpanzees (Pan troglodytes) provide the largest sample of recorded lethal coalitionary aggression in nonhuman primates, and most long-term chimpanzee study sites have recorded coalitionary killing of conspecifics. 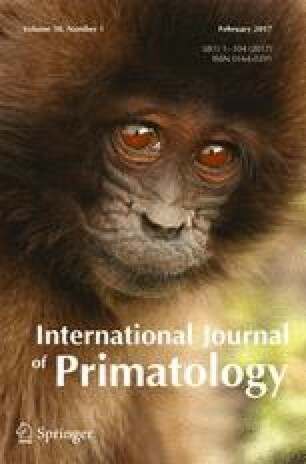 We report an inferred lethal attack by resident males on a former alpha male chimpanzee (P. t. verus) at Fongoli in Senegal. We describe the male’s presence in the community, his overthrow, social peripheralization for >5 yr, and his attempt to rejoin the group as well as circumstances surrounding his death. We report attacks by multiple chimpanzees on his dead body, most frequently by a young adult male and an older female. The latter also cannibalized the body. Coalitionary killing is rare among West African chimpanzees compared to the East African chimpanzee (P. t. schweinfurthii). This pattern may relate to differences in population densities, research effort, and subspecies differences in biology and behavior. The online version of this article (doi: 10.1007/s10764-016-9942-9) contains supplementary material, which is available to authorized users. Research was conducted with the permission of the Republic of Senegal and the Eaux et Forets of that country. Inspecteur Guisse provided assistance following the death of Foudouko per Fongoli Savanna Chimpanzee Project and Eaux et Foret protocol. Dondo Kante, Michel Sadiakho, Mboule Camara, and numerous students provided assistance in the field. Suggestions from three anonymous reviewers as well as the editor significantly improved this manuscript.